The big window and wall is based on a scene where Kira and Lacus are talking in the Archangel when Lacus gets captured. A lot of Lacus's hair was cut out of the scan so I spent aaaaages drawing it out. I hope it looks right. Changed name to "Moonlit Kiss". Thanks to comprogrammer for suggesting the name. Thanks to melmachine18, Kitten, Ayamael and Iyasis for their comments and suggestions :) which helped me improve it. After learning that what I used to think was my best work was crap on AP, I thought, "I'll show 'em!" and decided to completely remake the wall with shiny new everything. Everything on the wallpaper is made from scratch. Star field, planets, wall, the whole lot. Thanks to Greg Martin's star field tutorial. All characters are vectored. The Kira & Lacus scan I originally got it from minitokyo a long time ago, uploaded by kyroooo. Can't seem to find it again. Scan used for Haro is uploaded here on MT by cagalli88. Scan used for Tori is uploaded here on AP by fneder. Thanks to all these people for sharing! If anyone's curious this is what it looked like before. Final thanks to all the people of session zero on AP who helped me out! Really, huge thanks. Honest criticism only makes us better! ~*lol, the name is fine, its the pic that counts! Blending is good. There are a few edges on the scans. Good luck on the next wall. Wowies, this is very nice! I love the background, the starry sky is really beautiful! Awesome work! 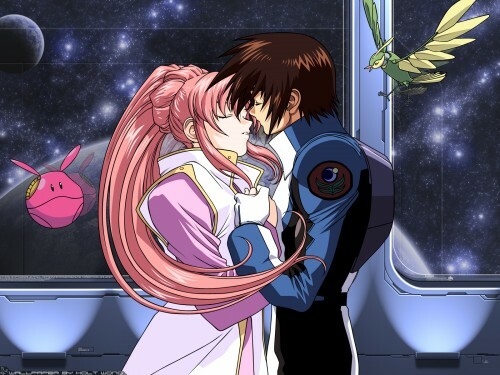 Kira and Lacus looks so cute here! And Haro adds a very nice touch! Amazing planet, and concept! Great work, Keep it up! nice wall, it look so romantic, i like the way the glass reflect effect! good job! nice idea you had with Haro's reflection... and of course, i love the stars and planets... ^^ Great job Holt!! keep it up!! I love the celestial background. The moon/planets are nicely done and are amazingly detailed. The massive amounts of stars fill the remaining space well. I like how some stars are bigger, forming constellations, but they appear to be a bit square-ish. It looks somewhat awkward that Lacus and Kira and smack in the middle of the wallpaper, maybe they could be shifted a little off center. But then again, I'm artisticly-challenged, so what do I know? ^^"
cutttte wall..... well is nice .... holt bravo !!! great wallpaper, the background looks nice and the reflection makes it look even beter. Wow, this is a great wall. I like the Haro, who is reflected in the window. A really good work! i really love this picture but you've made it even more beautiful by creating a perfect background to go with it, thus, creating a romantic and peaceful scene. p.s. good job with those planets...I think realism is important...and you've done it flawlessly!